In this article I’m doing Elliott Wave Analysis of Nifty and discussing Swing Trading Strategies for the same. 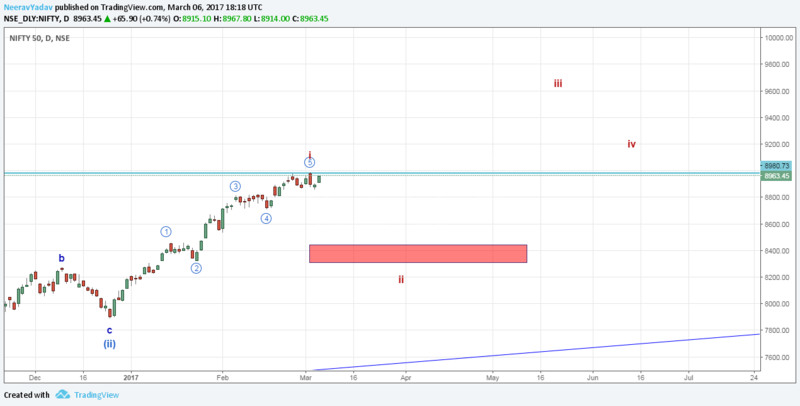 As of now it seems that the 1st leg of impulse has completed near the recent high around 8980, but there is a slight possibility that the Wave 5 of this impulse might head a bit higher, however from a trading perspective this implication will have no effect and the strategy would be to buy on dips. 1. If Nifty gives a correction till the 8445 to 8300 region then buying can be done on this pullback. 2. Or buying can be done at the break above the high of 8980 region. I will update further as market proceeds.